Access to healthy foods is a concern for many in our community. In October, Healthy Waltham hosted a Healthy Food Access Forum at the Waltham Public Library. We heard from several organizations about resources already in place, but also barriers to healthy eating for many in the community. Our goal is to further our understanding of the resources and challenges, to make connections across sectors to help solve some issues, and to brainstorm together how better food access may be accomplished for Waltham. To that end, we have formed a Healthy Food Coalition to examine these issues further. The purpose of this coalition is to gather representatives from various organizations involved in the food system and serving those who sometimes experience food insecurity – a lack of ability to provide food for their families on a daily basis. We plan to meet quarterly over the next year. If you are interested in the conversation, please send us an email at info@healthy-waltham.org. Please read more about our Healthy Food Access Forum in our article in the Waltham News Tribune here. Come join the conversation for Waltham’s healthy food vision. This program is free and open to the public! Seating is limited, so RSVP is encouraged to info@healthy-waltham.org. To find out about sponsorship opportunities for Healthy Waltham’s 10th anniversary, please click here. We are presenting this forum as part of Waltham’s Food Day activities. Food Day, October 24, is an annual event focused on food. Food Day inspires people to eat healthier, and shines the spotlight on the need to ensure access to healthy, nutritious food for all and to encourage improved policies to solve food-related problems. This year’s Food Day has a special focus on food access and food justice. To learn more about Food Day, please see the Food Day website here: http://www.foodday.org. What is Food Day? Food Day, October 24, is a national celebration of eating real food and the advancement of better food policies. It is also a day to encourage every American to reflect on how to improve their own diets and food-related problems in their communities. To celebrate Food Day, many organizations across the nation host events ranging from school activities to community festivals. Last year, there were at least 4,700 Food Day events! One of the reasons why Food Day was created is because of the dire consequences of the common American diet. This diet consists of consuming unhealthy levels of calories, sugar, meats, and fats. The common American diet can lead to many serious health consequences such as obesity, heart disease, and more. Plus, our environment is also severely affected when people over consume processed food! Eating real, healthy foods can not only help maintain good health, but also make our food system more sustainable. By celebrating Food Day, we are emphasizing the importance of living healthy and in a society where food sustainability is a must! It’s easy to celebrate Food Day! Reflect on the positive things about your diet and think about any changes needed to improve your diet. We have a lot of great resources, like easy, healthy recipes and information about healthy eating. Check out our recipes here. You can also learn more about food sustainability and food-related issues such as food access by going on Food Day’s website. If you are interested in food sustainability and food-related issues, come to Healthy Waltham’s Healthy Food Access Forum on Oct. 22 at the Waltham Public Library, 6-8:30 PM! 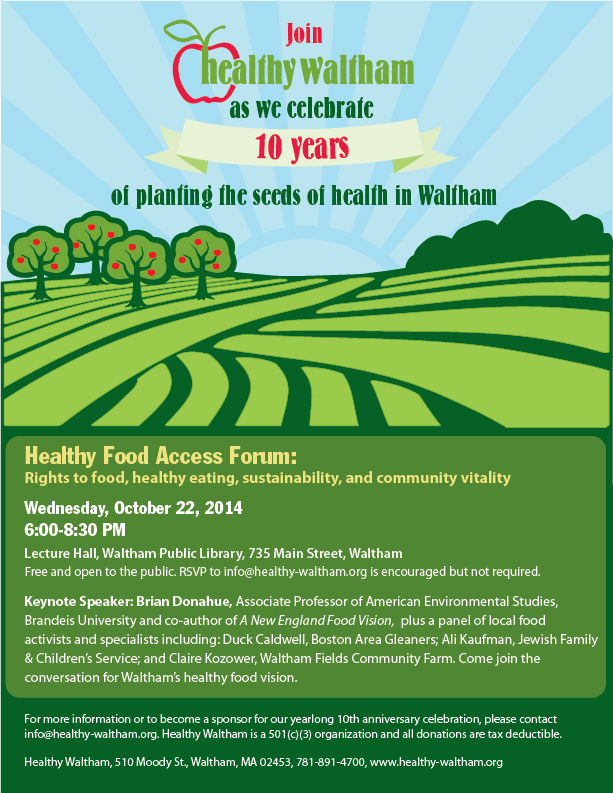 Healthy Waltham is holding this forum to discuss affordable access to healthy foods, food sustainability, and more! You can read more about it here. There are also lots of cool Food Day events happening in the Boston area. Check them all out here. Food Day doesn’t have to be just one day. Let’s all work together on eating healthier and striving for a better food system every day! Try some healthy local collards using this recipe from our Chef Reva! Lime and coconut make it different. Delicious cold, it serves approximately 6. We served samples of this dish at the Waltham Farmers’ Market recently. Preheat oven to 350F. Spread coconut on a baking sheet and toast in oven until lightly browned, 2-3 minutes. Remove from oven and cool. Wash collards in several batches of cold water and let drain in a large colander. Heat a large pot over medium heat and melt coconut oil. Add garlic, salt and red pepper flakes and cook until fragrant, about 1 minute. Add collards and cook, stirring occasionally until beginning to wilt, about 5 minutes. Add basil, vinegar, soy sauce and black pepper and continue to cook a few minutes more until leaves and stems are crisp-tender. Stir in lime juice and serve collards warm or at room temperature, topped with toasted coconut.